What material should you choose for your deck? Choosing the right material is just as important as choosing the right builder. Until the mid-1990s the only material regularly used for exterior decks was pressure treated wood. Most pressure treated flooring sold today is labeled as “mixed southern softwoods”-the pressure treated wood you may have used years ago was probably southern yellow pine – BIG difference. 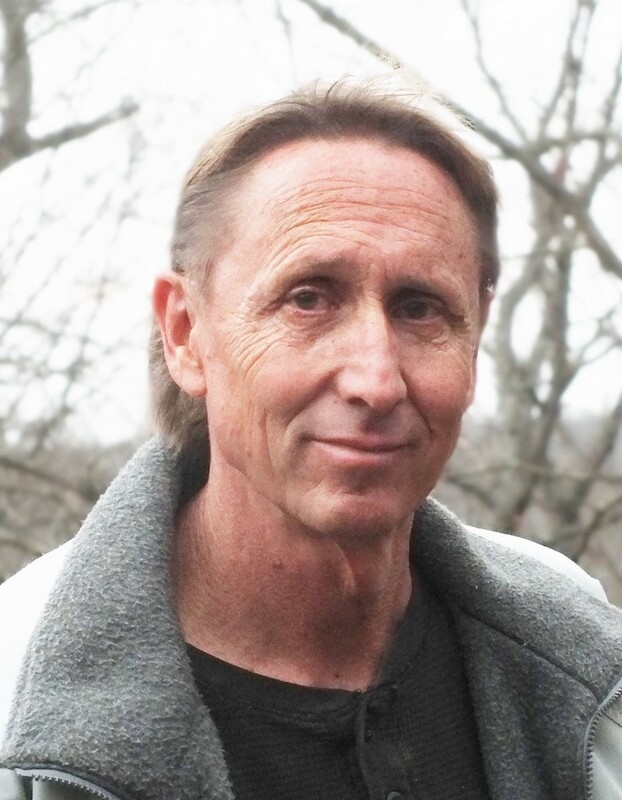 Many of the new genetically altered species grow very fast to allow fewer years to harvest. That means fewer growth rings (grain layers) that are what give the wood its strength. The soft, porous light colored areas between the dark growth rings are wider, absorbing more of the initial pressure treatment fluid (resulting in more shrinking and splitting as it dries). In a nutshell, most pressure treated sold today is not nearly as durable and strong as it once was. Even the Southern Yellow Pine has been altered and the 2012 code revisions have reduced the allowable spans for southern yellow pine because of this issue. Pressure treated wood (PT wood) is relatively inexpensive, readily available in nearly every dimension, and easy to use. PT wood is generally has a limited lifetime warranty that covers fungal decay (wet rot) and termite infestation only. When the material hits the jobsite it is very saturated (wet) with the fluid used in the PT process. This fluid eventually dries out of the wood leaving chemicals behind that inhibit rot. The problem with very wet wood is that it is also “swollen” and as it dries, it shrinks, splits, and warps. These issues are far worse in locations where the material is exposed to direct sunlight. Sealing and or staining the PT wood on a regular basis will greatly reduce these problems but no matter how well you care for it PT wood, it is going to shrink, split and warp over time. (The horizontal surfaces that are exposed to direct sunlight are most vulnerable). Note: The structural framing portion of any deck will almost always be PT wood – it is sheltered from the sun or can be covered so that the damage is minimal. Definition: Composite decking and rail is generally made of material such as plastics and very fine wood saw dust, which are mixed and compressed with intense pressure and heat. While these early generation products held up well, they were commonly plagued by problems related to staining, mold, color variation and fading. In response to these composite lumber issues the Trex company (followed by most of the major manufacturers) have developed “encapsulated” products that have a hard, impermeable layer on the exposed surfaces that are extremely resistant to any sort of staining mildew etc. These new cap stock products have effectively cured the staining and mildew problems. Nearly impervious to the damaging effects of the sun. (Zero splitting, warping, cracking, minimal shrinking due to thermal expansion/contraction characteristics. Nearly impervious to staining or fading. Nearly impervious to mold or mildew. Cost – Encapsulated flooring adds approximately $2 to $7 (depending on which “line”, color and fastening method) per square foot over PT wood for deck flooring only. (Rails and fascia are not addressed here). A bit more slippery, particularly on wet locations. The hard outer shell of encapsulated decking tends to feel substantially hotter to the touch. In full sun, middle of summer situations too hot for bare feet. See a full description and comparison of the latest Trex flooring on the “Compare Trex Flooring” tab. All of the advantages of standard PT rail with the added advantage of a top cap that is nearly impervious to the damaging effects of the sun. The top cap is the most visible and most damage prone component of the rail. If you have an existing PT deck, look at the rail and notice how the top cap is far more damaged than the vertical posts and pickets. Also consider the top cap is the part of the rail that you touch the most when using your deck. A composite top cap is the best “bang for your buck” that you can get when economy is the driving force in your material choice. The vertical portion of the rail still needs a UV protectant type treatment at regular intervals. Vinyl rail has become a popular choice for many deck projects. Usually white, vinyl rails offer a clean formal appearance with very little maintenance. Vinyl rails use aluminum cores (inserts) that go inside the top and bottom rail to give the rail the strength required by code. When vinyl rails are used, I also wrap the outer edges of the deck and stair stringers with white, wood grained vinyl coil stock (similar to the material used in vinyl siding). Cost-wise, vinyl rails are mid-range, above pressure treated and composite cap but lower than full composite and more elaborate rails. Very little maintenance (clean with soap and water occasionally). Formal look doesn’t go well with some house styles (rustic log homes, etc.). While vinyl rail is fully code compliant, it often doesn’t feel as “rigid” as some other rail types do. Vinyl and aluminum “flex” more than many other rail types. Vinyl rails (as well as most composite rails) mount inside the perimeter of the deck, using up about 5”- 6” of floor space. 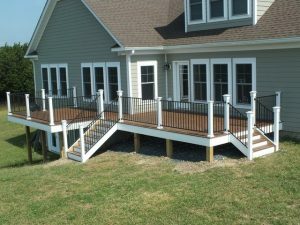 Composite rails have become popular on high-end decks. Colors and styles are vast with too many options to cover here. (Visit the Trex website to get some ideas). Many colors and finishes available with mixing and matching color schemes an option. More rigid than vinyl rail. Cost- composite rails can be expensive. Composite rails (like vinyl rails) mount inside the perimeter of the deck, using up about 5”- 6” of floor space. Frequently the outer edges of the deck, as well as the stair stringers and risers, are covered in a matching ¾” thick material which matches the color of the rail. This can add considerable cost. Solid metal rail systems can be steel, fabricated and welded to fit on-site, or pre-manufactured aluminum rail sections that are cut to fit and assembled on-site. Metal rail systems are generally stronger and can use thinner components, thereby making the rail less obtrusive (opens up the view). Using black rails also helps “hide” the rail. Steel (fabricated on-site) rail can be made to fit any un-orthodox design. Pre-manufactured aluminum rails come in sections with a baked on powder coating in a choice of colors and can be attached to matching aluminum posts or mixed with wood, vinyl, composite or masonry posts. Like steel rails they use thinner components, making them less obtrusive. Steel, fabricated on site rails are usually painted. Paint does not last as long as some of the more modern coatings and will obviously need to be re-painted at some point.